His Holiness the 34th sMenri Trizin, the Spiritual Head of Bön, visits Yeru Bön Center as part of his World Tour. Yeru Bön Center invites you to be a part of his historic visit! This is exciting news for the World Wide Yungdrung Bön Community. His Holiness the 34th sMenri Trizin, Dawa Dargyal Rinpoche, will travel to the United States, Europe, Mexico, and Canada this year. 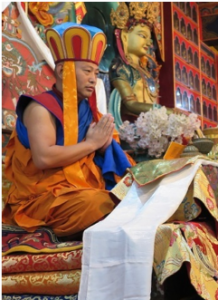 Yeru Bön Center is thrilled and honored that His Holiness accepted our invitation to come to Yeru Bön Center and Yeru Retreat Center in Minnesota July 29th – August 5th, 2019. Latri Nyima Dakpa Rinpoche met with His Holiness last month to discuss plans for His Holiness’ visit and to confirm what he will teach during his visit to Yeru Bön Center. We are now excited to announce that during His Holiness’s visit, we will have five different special events for Bön practitioners and friends of Bön from all over the world to consider at Yeru Bön Center from July 15th through August 4th, 2019. We thank Tenzin Wangyal Rinpoche and Ligmincha International for inviting His Holiness and inviting Yeru Bon Center and other Bön Centers to be a part of His Holiness’s World tour. There are many details to be worked out in preparation of His Holiness, the 34th sMenri Trizin’s tour. Ligmincha is handling many of the details and helped pave the way for a successful World Tour for His Holiness. Thank you! We start our amazing week with a Welcome Gala for His Holiness, the 34th sMenri Trizin. 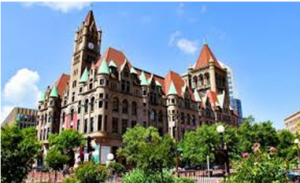 The gala will be held at the Grand Landmark Center in St. Paul. The evening will include a sit-down dinner prepared by Lhakpa Dorjee, requested personal Chef to His Holiness the 14th Dalai Lama; a Tibetan cultural program; a talk from His Holiness; and more. His Holiness will give a teaching and initiation on the Du Tri Tsu, and a transmission of the Three Essences of Bön (nying po namsum), at the Yeru Retreat Center. The Du Tri Su initiation and the Three Essences of Bön is one of the most popular practices for all Bön practitioners. Receiving an initiation and transmission of these important teachings from His Holiness will enrich and give you a powerful blessing. His Holiness will shine a powerful guiding light upon us, to guide us to overcome and remove our negative emotions. His light will guide us to rise and overcome both temporal and spiritual obstacles caused by deep seated negative karma or life trauma. By practicing the Du Tri Tsu you will purify your negative blockages so you may continue your spiritual development in an open and beautiful way. 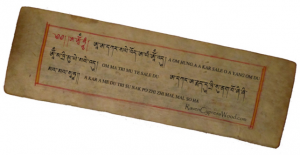 To receive this blessing of the Du Tri Tsu is a gift to be shared with all sentient beings. Khyung Mar Red Garuda. In addition, His Holiness will bless us all with the opening of the Khyung Mar Kyil Khor (Sand Mandala), and give the teaching, initiation and blessing of the Khyung Mar Sand Mandala. This Khyung Mar Sand Mandala will be constructed by four geshes who will arrive on July 15th, prior to His Holiness arriving. This will be the first time a Kyil Khor, Khyung Mar Sand Mandala will be built with the blessing of His Holiness in the United States. Khyung Mar (Red Garuda) is one of the deities in sNag (Tantra). 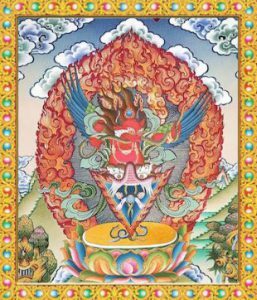 The Khyung Mar Red Garuda is a powerful deity who empowers us with the ability to heal ourselves and others. The healing practice of the Khyung Mar is known to be effective in healing physical, emotional and spiritual obstacles. It protects against outer, and inner and secret obstacles. This practice is used for inner transformation. Through deep inner transformation one can be on a strong spiritual path. 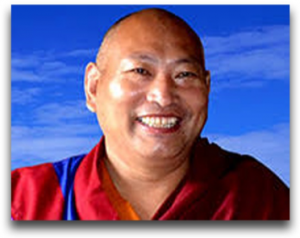 Latri Nyima Dakpa Rinpoche has taught the Khyung Mar practice for over 15 years in the United States. He has held many Khyung Mar retreats at the Yeru Retreat Center, where he has taught the Khyung Mar Fire Puja and Khyung Mar Drubpa, assisted by Geshe Nyima Kunchap. This is a great opportunity for practitioners to receive a deeper and more enhanced blessing of the Khyung Mar Practice, by receiving the teaching, and initiation from His Holiness. 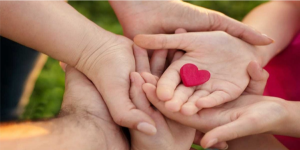 This is a once-in-a lifetime opportunity and a way to make a strong spiritual connection to this lineage. Pha Me Cham Tse is Love of family. This has never been done before. His Holiness and Latri Nyima Dakpa Rinpoche feel family is so important, they wish to have a day devoted to families. We invite you to bring your family, spouse, partners and children. His Holiness will give a rare talk on the importance of family, the love of family, forgiveness, compassion and acceptance. His Holiness will give a talk with everyone, including children, on the relationship between the child and the parents. Your relationship as a family. Your heart to heart connection of love, compassion, forgiveness and understanding. He will share the value of family and especially the children at every age. During this day there will be family events: a special treasure hunt both in the forest and on our private Garuda Lake, and other fun activities on 425 acres. The day will include a special art work, cooking class and end with a beautiful bonfire, stories and Tibetan smores. We have nine Geshes joining us for the week. They would love to participate in the treasure hunt, the artworks, canoeing, kayaking, paddle boarding with the family. We are providing activities for the children while you are in each teaching. It will be like going to Camp Garuda for the kids. Your spouse or partner are welcome to join the Du Tri Tsu or Red Garuda teaching, but if not, no worries, they will enjoy the retreat center, if they would like. So, you can relax and enjoy the other teachings knowing your children are having a great time. If you can’t come with your family, don’t worry. 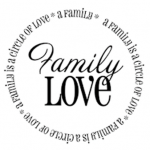 We are all family, and sharing the love will be very special. The week will close with His Holiness giving blessings upon the new Temple dedicated to His Holiness, the late 33rd sMenri Trizin. This is also the perfect time to thank everyone who helped organize, and to make His Holiness’s visit memorable and wonderful. Visiting Geshes. Not only are we blessed to have His Holiness with us, but we will also have nine Geshes in attendance at the Yeru Retreat Center, who will join in the teachings and activities. Dawa Dargyal Rinpoche was selected as the 34th sMenri Trizin, the spiritual leader of the Bön tradition and abbot of sMenri Monastery in Dolanji, India, on January 1, 2018. In February 2018, Bönpos worldwide joined in celebrating the selection of the 34th sMenri Trizin at sMenri Monastery. On September 6, 2018, a formal grand enthronement ceremony took place at sMenri Monastery. In recognition of his enthronement and as a way to deepen connection with His Holiness, Yeru Bön Center extended an invitation to His Holiness to teach at Yeru Retreat Center as part of his first trip to the West after his enthronement. Don’t miss this special opportunity to receive teachings from the head of the Bön tradition! All teachings will be translated into English. 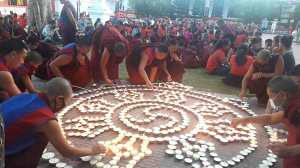 July 15th – July 28th 2019 – Khyung Mar Sand Mandala creation with four Geshes. Practitioners are invited to witness the creation of this special Khyung Mar Sand Mandala. This will be a blessing all by itself. July 29th, 2019 – Welcome His Holiness the 34th sMenri Trizin at the Minneapolis Airport. Time to be determined. July 30th, 2019 6:00–10:00 p.m. – Welcome Gala for His Holiness at the Landmark Center in St. Paul. July 31st, 2019 – His Holiness arrives at Yeru Retreat Center. We ask everyone to please be at the Retreat Center by 11:00 am to greet him. Welcome talk and dresil (sweet rice). August 4th, 2019 – Tashi So Gratitude and Temple Gratitude. 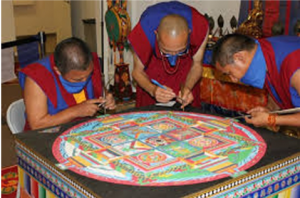 Starting on July 15th, four Geshes will arrive at Yeru Retreat Center to create the Khyung Mar Sand Mandala, (Kyil Kor). We invite practitioners to witness this special event. This is a good time for a private retreat and meditation. It may be possible to visit the monks during their free time. July 29th – There will be ride sharing for anyone who would like to go to the airport to greet His Holiness and to attend the Welcome Gala on July 30th. You will need to secure a hotel for the evening of the 29th and 30th if attending the Airport Greeting or Welcome Gala. We are looking into renting a large home for shared lodging. Contact Yeru Bon Center if interested. July 30th – The Welcome Gala will begin at 6:00 and end at 10:00 p.m. at the Landmark Center in St. Paul. July 31st – A shuttle bus will leave at 7:00 a.m. to Yeru Retreat Center from Minneapolis (departure location to be determined). The shuttle will arrive at the Yeru Retreat Center around 9:30 a.m. Breakfast will be available at the Retreat Center. This would be a good time to unpack and enjoy the Retreat Center. His Holiness will arrive at the Yeru Retreat Center at noon. We would like everyone to arrive at the Yeru Retreat Center by 11:00. As part of the arrival of His Holiness, there will be a welcome talk and dresil (sweet rice) will be served. August 1st – 4th – The Retreat Center events begin. 10:00 am – His Holiness leaves Yeru Retreat Center to return to Minneapolis. 11:00 am – The Shuttle Bus leaves Yeru Retreat Center. The shuttle bus will arrive in Minneapolis at 2:00 p.m. at the airport and another location (to be determined). 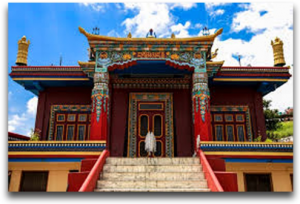 There is a possibility the Tibetan American Foundation will have an evening event. Everyone is welcome to join. When this is confirmed, we will make an announcement. The weather in July is beautiful, the lake will be warm, the stars will shine brightly, you will hear the sounds of the loons and the swans and see the soaring of the eagles and the deer playing in Garuda Lake. There are insects in the woods, and we’ll want to use mosquito and tick repellent. We will use Deborah’s special organic, non-toxic mixture. We have used this in the past and had minimal mosquito activity, with no complaints about ticks. The Retreat Center had the scent of mint, lemon, and lavender. After her extensive alchemical efforts, it works! You will have the option of a Yeru Sleeping Hut or a tent to enjoy during your stay with us during this retreat. The tents are more like a glamping tents, very cozy. The huts are cozy and indoors. There are some family huts with lofts, and tents for family camping. There are several hotels in the area. If you stay in a hotel, plan to arrange your own transportation to and from the Retreat Center. Housing will be reserved on registration only. Looking at our current list, we expect this event to be sold out. We strongly advise you to register early. Check the website for registration information and payment options. There will be wi-fi located in the computer tent. A chef will prepare fresh daily meals. If you have special dietary needs, please let us know on registration. If you have a very special diet and would prefer to prepare your own meals, there are several areas where you can prepare your meals. There will be a storage area available. You will be responsible for your own clean up. There will be beverages available throughout the day. To be a part of this event – $300.00 – Includes housing and meals. If you are attending the Kyil Kor and the retreat, please use, please use code MANDALA when registering for the retreat. $150.00 DISCOUNT for attending both. Housing prices include a bed, pillow and bed linens. Bring your own towel. If you are not able to attend this retreat, we will miss you. We understand the demands of modern life. We do welcome donations, to go towards an honorarium and travel costs for His Holiness, and costs for the nine Geshes.